The warehouse environment is full of hazards. 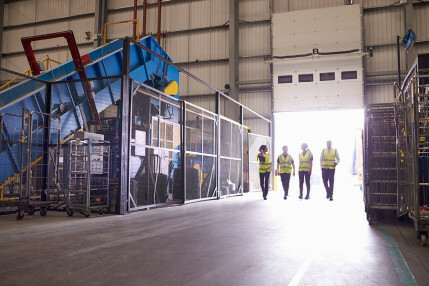 One of the many hazards that plant managers need to be aware of is protecting walking workers from workers operating material handling equipment such as pickers and forklifts. 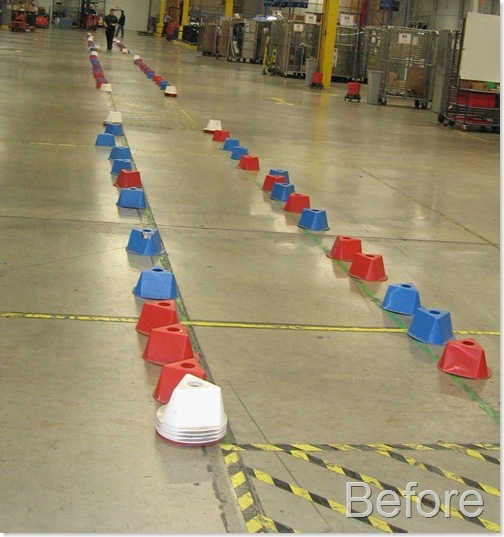 We worked with one of our customers to provide a solution that offered a safe right-of-way to pedestrians walking near utility vehicles in the warehouse. 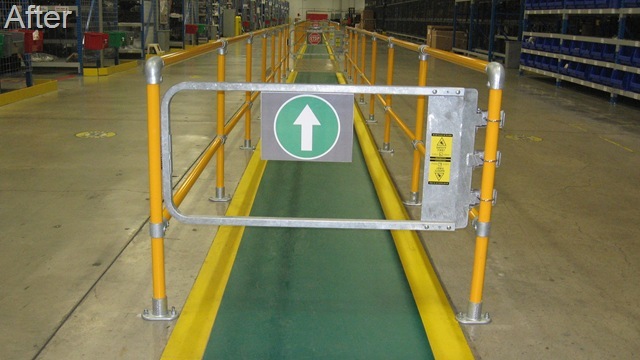 Guard railing puts a physical barrier between the pedestrian and the motorized equipment, keeping the worker safe from harm. For this customer, our Kwik Kit safety railing kits provided a solution that was cost effective and easy to install. Kwik Kit comes partially assembled, reducing the number of man hours needed to complete the installation. Kwik Kit also comes powder coated in safety yellow, providing a solution that is durable and attractive. Here is the scenario BEFORE the kitted guard railing was installed: No physical barrier to protect the worker. Only a visual barrier of cones was present to designate the walkway. 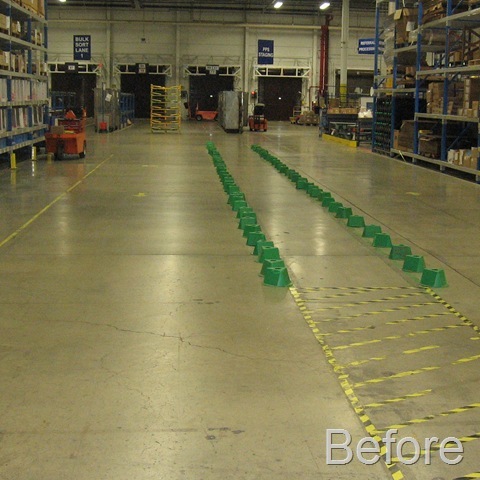 Here is the scenario AFTER the Kwik Kit safety railing was installed: Workers are now clearly separated from hazards. Workers are also made aware that they are leaving the "safe zone" via the self closing industrial safety gates. 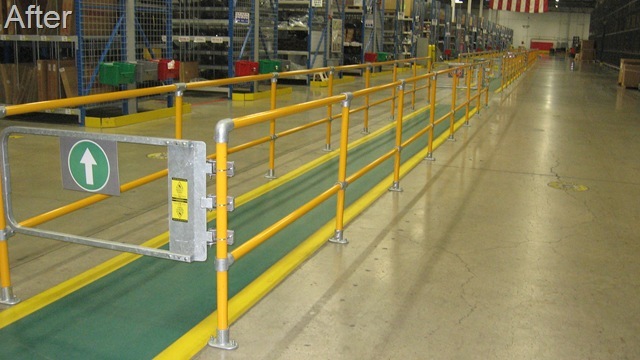 Durable - Strong steel railing withstands impacts and protects workers in the walkway. Easy to use - Uprights come preassembled and powder coated safety yellow. Modular - Railings can be configured to suit any environment. Safe - The ultimate priority when considering a product. Does it protect the worker from the hazard? Kwik Kit does the job! Allow us to help you separate your workers from dangerous working conditions - contact our sales engineer. 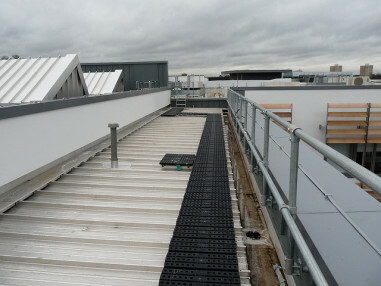 Kee Safety has released an innovative new rooftop walkway system. 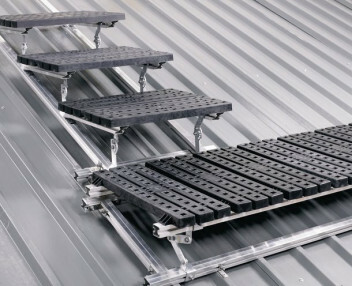 The system, designed with safety and installation in mind has combined various attachment methods to make installation of this modular system a snap.